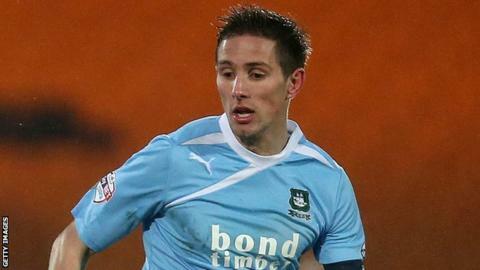 Plymouth Argyle captain Conor Hourihane says the club are focused on making the League Two play-off places. "We've got seven cup finals and we'll try and get as many points as we can," Hourihane, 23, told BBC Radio Devon. "Hopefully it'll be enough to get in the play-offs." The game will come 11 days after Plymouth's last defeat, a heart-wrenching 2-1 loss at home to biggest rivals Exeter having been a goal up. "It's been a long wait for our next game," Hourihane said. "Last Tuesday night is something we want to put behind us, especially after being one up and then losing the game against your main rivals. "It's hard not to look at the table - after the Exeter game it was something I personally tried not to look at. The next game was so far away it would drive you mad if you looked at it all the time for the 11 days you don't have a game." And Hourihane believes his side are now in a four-way fight for the final two play-off places as they bid to try and win promotion into League One. "It's looking like Southend, Oxford, York and ourselves are fighting for two places out of four so it's something that we're striving to get into. "Having momentum at this time of the year going towards that play-off place is something that's very important as well. "There's going to be twists and turns throughout the last seven games and hopefully they'll go in our favour."